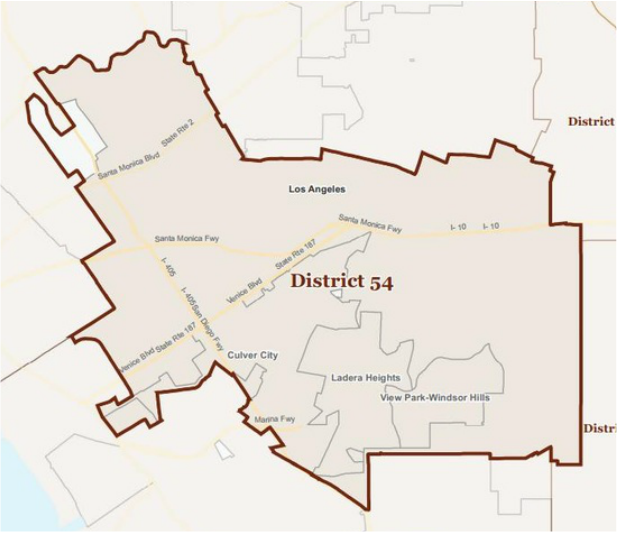 Democrat Sebastian Ridley-Thomas currently represents Assembly District 54 and will not be termed out until 2024. Ridley-Thomas is expected to easily win re-election in 2016. Sebastian Ridley-Thomas was elected in December 2013 to represent California's 54th Assembly District, which includes the Los Angeles County communities of Century City, Culver City, Westwood, Mar Vista, Palms, Baldwin Hills, Windsor Hills, Ladera Heights, View Park, Crenshaw, Leimert Park, Mid City, and West Los Angeles. Ridley-Thomas previously served as public policy director for State Senator Curren Price. In this capacity, he advised the senator on economic development, transportation, housing, public safety, and local government issues – all of which are of critical importance to constituents in the 54th Assembly District. Ridley-Thomas also worked as a staff member in the district office, where he was responsible for a caseload of 900,000 residents in Greater Los Angeles. The Assemblymember has also served as legislative consultant to the Senate Select Committee on Procurement, where he worked to ensure small business owners in underserved communities received their fair share of state contracts, and as the political director for the nine-member California Legislative Black Caucus. Ridley-Thomas is dedicated to finding sensible solutions to the issues facing Los Angeles residents. His commitment to public service was inspired by his mother – Avis Ridley-Thomas, a pioneer in conflict resolution – and his father, Mark Ridley-Thomas, chairman of the L.A. County Board of Supervisors and founder of the community empowerment movement that has become a model for communities nationwide. Ridley-Thomas received his Bachelor of Arts degree in Sociology from Morehouse College, where he held several leadership positions. A graduate of the CSU Sacramento Capitol Fellows Program, he trained in mediation and conflict resolution at UC Davis Extension and CSU Dominguez Hills. Ridley-Thomas lives in Los Angeles.